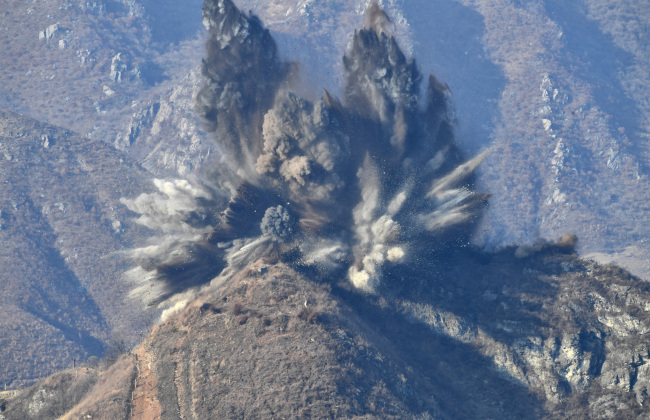 North Korea on Tuesday demolished 10 frontline guard posts located inside the heavily fortified Demilitarized Zone, Seoul’s Defense Ministry said, in a symbolic effort to sustain momentum for inter-Korean detente. According to the Ministry of National Defense, the demolition began at 3 p.m. by simultaneously exploding the guard posts scattered across the DMZ. The ministry said North Korea had notified it of the plan several days earlier. The two Koreas had originally planned to explode the guard posts after agreeing to remove them during the Pyongyang summit in September, but South Korea decided to use excavators to demolish its guard posts. South Korea began demolition work on Nov. 12. While the two Koreas’ militaries had agreed to destroy a total of 22 guard posts, they decided to preserve one guard post on each side of the DMZ -- including the one visited by North Korean leader Kim Jong-un. The two Koreas’ defense chiefs pledged at the Pyongyang summit to remove all guard posts inside the DMZ, starting with the withdrawal of guard posts within 1 kilometer of the military demarcation line as a “preliminary measure.” A total of 220 guard posts are believed to be located in the DMZ.